“A good leader can make a profound difference,” says Julio Portalatin. He should know. As former president and CEO of Mercer and current vice chair of Marsh & McLennan Companies, and also as board director for the IT services company DXC Technology, he has led the conversation around the future of work and financial security at numerous events, including the World Economic Forum. He has taken his commitment to public service literally to the streets, taking part in Covenant House’s—a homeless youth nonprofit—annual “night on the streets” fundraiser and sitting on its board. And he has contributed to the future of higher education as a trustee of Hofstra University, where he holds an honorary doctorate. Portalatin sees these successes as the culmination of motivation, perseverance, and good intentions. The opportunity to join DXC came from networking. DXC formed out of a fusion of CSC and the Enterprise Services division of Hewlett Packard Enterprise. HP’s then-CEO Meg Whitman asked Portalatin if he would agree to be considered for a seat on the new board. He discussed the opportunity with Marsh & McLennan Companies’ board, who liked the prospect of exposing Portalatin and Mercer to additional cutting-edge viewpoints on automation, artificial intelligence, and other innovations shaping the future of business. This role has also given Portalatin insight into the difference between a CEO and a board director. “As CEO, your job, simply—although not simple to actually perform—is to run the company,” he says, which generally includes achieving high levels of financial performance, employee engagement, and client acquisition and retention, as well as serving the community. Portalatin says the CEO and board member roles can complement one another. Learning to change hats and take on a more advisory role at DXC, for example, has impacted his role as president and CEO of Mercer. “You come back to the home office and you’re a little more attuned, you’re listening a bit better, you’re even more open to being challenged and to the possibilities of what can be done,” he says. What advice would you give to Hispanic executives aspiring to corporate board positions? “Serve on nonprofit boards. Every nonprofit board has finance, compensation, planning, or audit committees. That experience will position you for corporate board consideration. Much of Portalatin’s work at DXC has involved understanding the company’s current market position and how the board can help bring it along its change journey. They’ve already identified and executed a handful of acquisitions focused on future growth. Additionally, Mercer’s work on executive compensation, workforce analytics, and digital HR solutions has made Portalatin a natural fit for DXC’s compensation committee, a high-profile role due to the “say on pay” vote by shareholders on the executive compensation program. “How you score on pay matters a great deal in terms of brand reputation and shareholder support,” Portalatin says. Even today, at what many would consider the top of any career, Portalatin continues to believe—and demonstrate—that a deep sense of purpose in his daily work will lead to a broader, more meaningful impact. 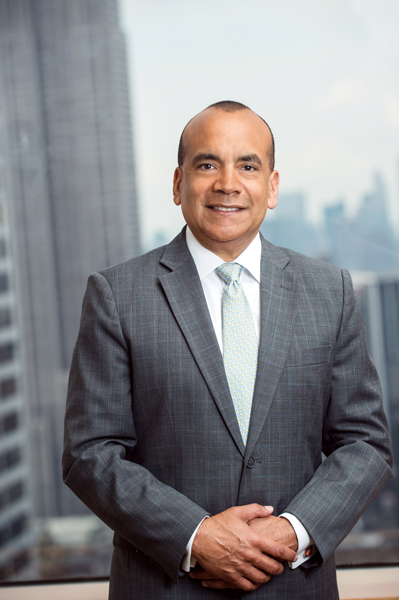 On an individual level, Portalatin has enjoyed giving career advice to current and aspiring board directors he’s met through the Latino Corporate Directors Association. “I’m never too busy to offer advice on how individuals, whether Latino or otherwise, can best position themselves for achieving their goals, whether that’s sitting in the C-suite one day and running a company, or sitting on a board,” he says. While he recognizes that Latinos are woefully underrepresented on publicly traded US company boards, here, too, he remains committed to his philosophy.